Human rights lawyer, Mike Ozekhome, has given his own interpretation of the Sallah speech credited to President Muhammadu Buhari where he addressed Nigerians in Hausa language. He gave the analysis while backing the call by Ekiti State governor, Ayodele Fayose for President Buhari to resign. 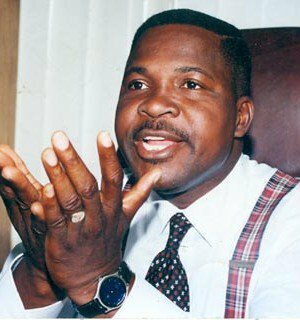 Ozekhome, speaking in an interview with Channels TV, said given Nigerians a voice in Hausa language, whether form the Buhari or not, was done in order to remind the Acting President that Buhari is still hovering around the Aso Rock in form of a cabal. He also noted that the said cabal has not given Prof. Osinbajo the chance to act as he ought to because they always throw in the name of the president whenever he wants to perform in that capacity. According to him, “We have seen a situation where what Dora Akunyili famously referred to as the cabal. The cabal has consistently flown the kite of Mr President, lurking behind and in front of the corridors of power which was why they gave us a voice some few days ago, whether genuine or stimulated, that it was President Muhammadu Buhari addressing Nigerians with much profanity, in his own native language of Hausa which is not the recognized lingual franca. “The point they tried to make is that whether we like it or not, Mr President is hovering around here, he is right here with us. “That has not given the acting president who has assumed full powers of the President, Professor Yemi Osinbajo SAN, the capacity, the ability, the space to act because he continues to look behind his shoulders whether they would throw in the name of the president. “So, Fayose is therefore right and right to call for Mr President’s resignation because it is clear that under section 143 and 144 of the constitution, the Federal Executive Council, which is made up of ministers appointed by the President himself, cannot recommend that Mr President be subjected to medical report by a panel set up for that purpose.